We take transcriptions to a new level! Tools and choices to ensure your project’s success. ListenLink is a unique software that inserts audio links into your transcripts. With just a click of the mouse, the feature will allow you to listen to a particular part of the audio marked with [unintelligible], [inaudible], or [crosstalk] in your transcripts. Considered as the first in the general transcription services market, this audio to text transcription tool will make your transcription experience seamless. To learn more about ListenLink, click here. Prioritize each transcription request based on your deadline and budget. A simple drop down menu allows you to select the desired turnaround time and transcription fee for each file! We accept unique transcription formats and templates! Just let us know and we will personalize your transcripts. 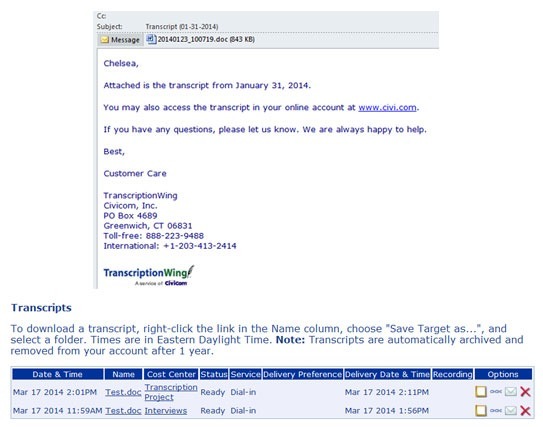 Need verbatim transcripts with timestamps? Identify important segments of your transcript for easier reference. Need to label speakers for better attribution? Just indicate KnowWho™ and we’ll take care of the rest. A comments section is available in your account which allows you to give directions to the transcription team for each file. Use it to give the team a heads up. Upload a discussion guide or a list of terms specific to your recording. This helps us ensure proper nouns in your transcript are identified properly. Transcripts are emailed to you as soon as they are completed and stored to your secured online account as well. We love feedback! Each transcript includes a way for you to tell us how we are doing with a simple click. Here’s what our clients are saying in TrustPilot about our work: Click here. Manage these transcription services with our exclusive and convenient online features!